Strategies for Managing a Multigenerational Workforce provides an authoritative, insider's perspective on understanding and motivating employees of different generations to drive company productivity and business success. 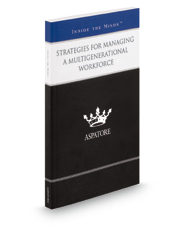 Written by CEOs from major companies around the world, this book addresses key topics, such as the varying working styles and expectations of each generation, strategies for communicating with a diverse workforce, and the unexpected challenges that can arise when employees from different groups must work together. Covering a range of topics from understanding the factors that motivate every generation to assessing the work-life needs of each group and creating benefits offerings that appeal to a range of individuals, these leaders share their insight on the many considerations necessary for successfully leading a multigenerational team. Additionally, they discuss strategies for leveraging the technical knowledge of younger generations while ensuring that the institutional knowledge of older employees is passed down, and they offer suggestions for the implementation of mentoring and other development programs to maximize the potential of every employee. The different backgrounds represented and the breadth of perspectives presented enable readers to get inside the minds of some of today's leading CEOs, as these top executives offer their thoughts on adapting to the changing norms of a new generation of workers in order to create cohesive teams that can lead their companies into the future.